Peppers – You Asked It! If you eat foods with hot peppers, you likely know the spiciness, or heat, can vary a lot. The heat comes from a group of compounds called capsaicinoids, including the well known capsaicin. This fiery compound causes “chemesthesis” in which the receptors inside the mouth react to pain, touch, and heat. Some may call it pain, others call it pleasure. Chile pepper varieties have a varying amount of heat and can also be quite different within the same variety. Growing conditions will also determine heat in peppers. If the plant is stressed, the peppers will produce more capsaicin. The pith, or white membrane, contains a majority of the heat from capsaicin. Simply cut out the pith, as well as the seeds, to cool down the heat. Save these to add back to a recipe if more heat is desired. The size of pepper makes little difference in heat pungency. On the outside, they look like hot peppers. But don’t be fooled! These small, sweet peppers have very little heat. But they pack flavor! Shishito peppers are mainly mild in flavor, but one in ten may have a little heat. The Japanese name for these is shishi which means lion. The tips of the peppers are puckered and looks a bit like a lion head. Farmers markets and some grocers may carry these. Look for peppers with wrinkles and twists, a narrow shape and about three inches long. They are usually green, but may have red and orange color also. Store refrigerated in a paper bag up to two weeks. Grill, roast, or sauté to blister the skin with a little vegetable oil, season with salt or other seasoning and serve immediately. Bell peppers can add a variety of color to many recipes. But they also add different amounts of nutrition. Red, yellow and orange peppers are the ripe versions of the green pepper. Therefore, they cost more. They are all equal in the macronutrients of protein, fat, and carbohydrate. The differences are found in the vitamin, mineral and phytonutrient content. In the case of vitamin C, green peppers contain 80mg per 3 ounce serving. 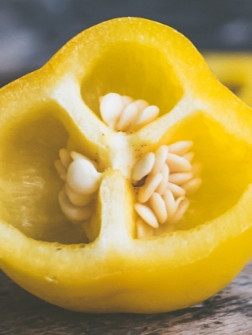 Yellow peppers have 184mg per serving. The Recommended Daily Allowance is 75-90mg per day so either pepper is a good choice. 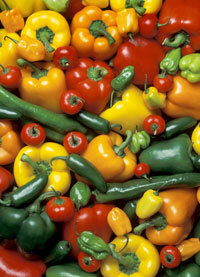 Different colors of peppers have different amounts of carotenoids. Red peppers are bursting with beta-carotene. Yellow peppers have very little beta-carotene. Orange peppers have 10 times the amount of lutein and zeaxanthin. Carotenoids are beneficial for eye health. 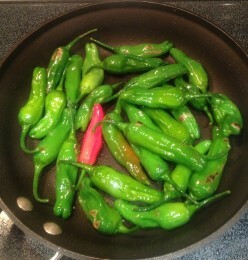 Bottom line, don’t skimp on peppers and add color to your meals!